Add a sophisticated look to your bird sanctuary with the Heartwood French Villa Bird House. The white and brown colors, durable materials, and square shape of this unit combine for a distinctive look, and provide small songbirds a lasting and lovely roosting spot. The square body of the shelter, crafted from cellular PVC, forms a beautiful and low maintenance structure, for you and your birds to enjoy season after season. A mahogany door sits on the front panel of this abode, with copper molding at its top for a bright accent. A 1.5" diameter entrance hole rests in this mahogany panel, contrasting the drop siding here, and allowing birds to access the shelter. A solid copper, hipped roof tops this home, flaring outward at the base for full protection from the elements. Its aged finish creates a timeless effect, while the generous, cast iron finial at the top completes the unit. A drainage hole on the base of the home helps the nest remain dry, and a copper disc on the back of the piece allows for seasonal nest checks and cleanouts. Use the included mounting plate to attach this home to a 4 x 4 post (not included), for a sturdy and attractive display. The cellular PVC body creates a lasting home which requires little maintenance, and can even withstand exposure to high humidity and freezing without cracking or warping, keeping the unit lovely for many seasons. 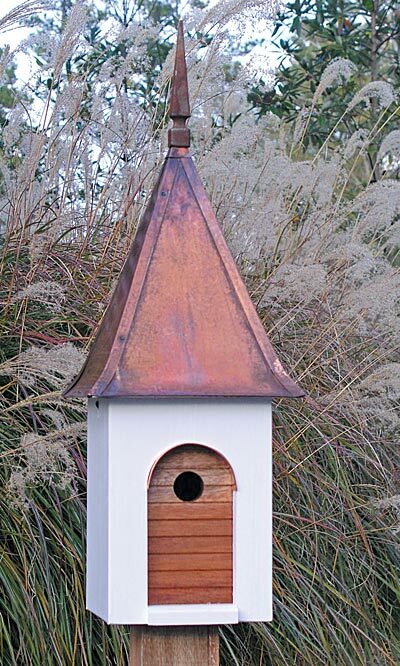 Bring a bit of the French countryside to your bird sanctuary with this French Villa Bird House. Made in the USA.